Narita airport — worth long struggle to build? Narita International Airport has played a key role in the aviation industry since it opened in 1978. But the history of Japan’s main international airport has been overshadowed by a longtime political struggle over eminent domain, pitting the government against local farmers and their support groups, mainly on the left, in one of the major social quagmires of the postwar era. Experts say Narita is now facing intensifying competition with other Asian hub airports, including Incheon International Airport near Seoul and Singapore’s Changi International Airport. What are some basics about the airport? Located in the city of Narita in northern Chiba Prefecture, the airport covers 1,125 hectares, has two runways — one 4,000 meters long and the other 2,180 meters — and two passenger terminals. Narita is Japan’s No. 1 gateway airport for international passengers, handling more than 33 million passengers in 2008 at an average of 91,616 a day. The airport also serves as a key trade port. Last year, 2.06 million tons of freight moved through Narita, making it one of the busiest airports in the world in terms of cargo handled. What international competition does Narita face and why? Although Narita used to be the world’s top airport in terms of air cargo handled, Incheon airport and Hong Kong International Airport passed it in recent years. Many parts of Asia have been strategically investing in key airport facilities to expand them into international hubs, boosting the competition with Narita, which has limited capacity. The expansionary drive is also coming as Japan’s economic presence in the region declines. In 2007, Narita handled 2.2 million tons of air cargo, while Incheon moved about 2.5 million tons and Hong Kong 3.7 million tons. Narita ranked seventh in terms of international passengers. Hong Kong ranked fifth and Changi sixth. Narita’s quality of service is also seen lagging far behind its Asian rivals. According to a 2008 survey by Airports Council International, Incheon Airport, which opened in 2001, was chosen best airport in the world in terms of passengers’ perception of quality, followed by Singapore, Hong Kong, Central Japan and Taipei. The government still finds it difficult to expand Narita’s small and crowded facilities partly because of protests from landowners, although 31 years have passed since the airport opened. What’s the historical background? In 1971, the government expropriated land for the airport via a two-time compulsory subrogation that led to violent clashes between protesters and riot police. Ultra-leftist elements rallied to the farmers’ call to keep their property, leading to long-term strife with transport authorities. During the second compulsory expropriation, three police officers were killed, more than 150 people were injured, and 375 protesters were arrested. After the government set the airport’s opening day for March 30, 1978, leftwing activists occupied a control tower for a few days. This incident led to the opening to be delayed until May. It wasn’t until 1991 when the two sides finally agreed to seek a peaceful solution through dialogue. A group of five intellectuals helped set up meetings between the farmers and the government. After the government issued a formal apology, the protest movement largely died down, but some farmers and activists continued their struggle, some by engaging in lawsuits. The company that operates the airport is now extending the shorter runway to have it ready by October. Will this help boost capacity? 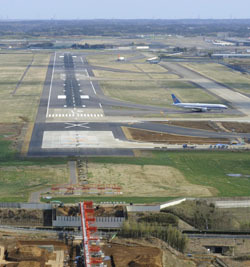 Work has started to extend the 2,180-meter runway to 2,500 meters. This will raise Narita’s annual capacity to 220,000 flights a year from some 200,000 at present. 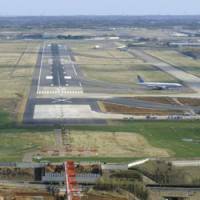 The operator initially sought a third, crosswind, runway but that plan has been scrubbed. Because of the legacy of discord with the community, the airport has to pay great heed to the issue of land rights and noise pollution. Is the government considering any other measures to improve the airport and better serve international passengers? The Keisei railway plans to debut a new express line next year linking Narita and central Tokyo in only 36 minutes. It takes about 50 minutes to reach central Tokyo on the current express trains and around 90 minutes on local trains. More drastically, the transport ministry is now trying to break a long-term taboo and turn Haneda airport, located near the heart of Tokyo, into an international airport. The government has long designated Haneda as a hub airport for domestic flights, and Narita as an international airport. For the government, moving key functions from Narita to Haneda has been considered taboo, given the high political costs the local governments and residents have had to pay to operate Narita airport. But now that Japan’s economic status in Asia and the world is on a decline, the ministry is finally pursuing the policy shift, recently allowing Haneda to handle more chartered international flights. The ministry’s ultimate goal is believed to be turning Haneda into a full-fledged international airport. It is expected to have its fourth runway operational next year. This will boost air traffic by 110,000 flights, 60,000 of which will be international.